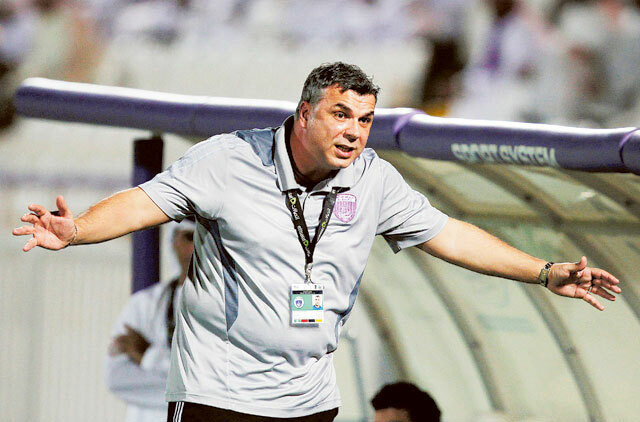 Dubai: Cosmin Olaroiu has reportedly extended his contract with Al Ain to 2015, ending speculation surrounding his future. The 44-year-old Romanian was said to be on the verge of joining Saudi Arabia’s Al Ahli last week on a three-year deal worth €2.5 million (Dh12 million) a season. However, the Jeddah-based club have now hired Portuguese former Porto manager Vitor Pereira to replace Serbian coach Aleksander Ilic. Al Ahli turned down fellow Portuguese Jorge Jesus of Benfica and Paulo Sergio of Apoel. Meanwhile, Olaroiu snubbed the Saudi club to sign a contract extension with Al Ain reportedly worth €4 million a season. His original contract with the club was €1.5 million a year. The Romanian press have now heralded Olaroiu as the world’s highest paid Romanian coach ahead of Shakhtar Donetsk’s Mircea Lucescu (€3 million) and Dynamo Moscow’s Dan Petresu (€2.5 million). However, Al Ain couldn’t confirm the situation when contacted by Gulf News on Sunday. If confirmed, news of Olaroiu’s extension will surely come as a relief to fans of the Garden City club. Before Olaroiu joined Al Ain in the summer of 2011, the club had just endured their worst ever league finish of 10th in the Etisalat Pro-League. The former Steaua Bucharest, Al Hilal and Al Sadd coach went on to win two consecutive UAE league titles and the 2012 Super Cup, but he failed to get the club past the group phase of this season’s Asian Champions League. Elsewhere, Quique Sanchez Flores will announce details of his two-year contract extension at Dubai’s Al Ahli at the club on Tuesday. The 48-year-old Spanish former Benfica and Atletico Madrid coach has won both the Etisalat and President’s Cups in his two seasons at the club and had been linked with French Ligue 1 side AS Monaco.